The beach is great, but nobody likes cutting their toes on glass. In fact, glass bottles aren’t allowed at most beaches or trails. Luckily, several Northern Michigan breweries offer your favorite beers in cans! So whether you’re out on the Great Lakes or hiking, we hope this list of local canned beers is one you’ll enjoy this summer. All photos provided by distributors. Please drink responsibly. This is the IPA for everyone. It’s easy to drink and rich with fresh, light hops and citrus. You can drink it all day while it carries you across waves or trails. Try it out at Stormcloud’s new tasting room or get a six pack for your backpack. Whether you’re out kiteboarding, hiking, cruising or tanning, Whiled Away IPA is your good vibes beer. A beer for those who don’t normally enjoy beer, Soft Parade Shandy is the perfect summertime drink. It’s a light bodied beer that tastes like a fruity dessert. Imagine a refreshing balance of sweet and tart that finishes crisp. Whether you’re out grilling savory meats, firing up spicy plates or cooking a classic Northern Michigan barbeque, crack open a Soft Parade Shandy to cool off your summer fun. If you want to turn it up a notch, try Short’s flagship fruit rye ale, Soft Parade. The beer for everyone. Local’s light was crafted in 2004 by Joe Short and called, “beer in its simplest form.” This is a summer beer you’re going to want to have in your cooler no matter what. Its versatility means its always a good bet. Craft beer lovers will enjoy it for its fresh hints of malted barley and lager yeast, while others will love its natural lightness. As far as pairings go, Head Brewer Tony Hansen says, “Local’s Light goes well with all food, but really shines with summery food like grilled meat, bright salads, seafood and spicy dishes. It also tastes better when eating outside.” Grab a case and roll out on a Northern Michigan summer adventure. It has the name and it packs the punch of Michigan heavyweight beer. This IPA will spark you with a citrus blend similar to Two Hearted. It’s the number one fan favorite at North Channel Brewing for its taste and locally named heritage. Brewed with Michigan Columbus hops during the boil and Citra hops for dry hopping, this is summer in a can. I’d say hardy-up if you want to drink this beer, but it’s not hard to down. The name comes from a brewery partner that lives in Folklore, but the beer is coming to everyone as a canned vessel. It’s popular during the summer because it has 5.4% ABV without giving up any flavor. Try this flagship lager with your crew. This beer has been promised as a summer smash hit. It’s easy to drink, but not without flavor. The lemon zests with the aromatic cream are lively as you take each sip. And it won’t drain you like the summer sun. This is the “un-shandy” because there’s no sugar added, but the lemon flavor is really a shining star for your taste buds. Try it out with a salty snack or those grilled vegetables you know you’re supposed to be eating. For those who want something earlier in the morning, this is a beer we recommended trying. 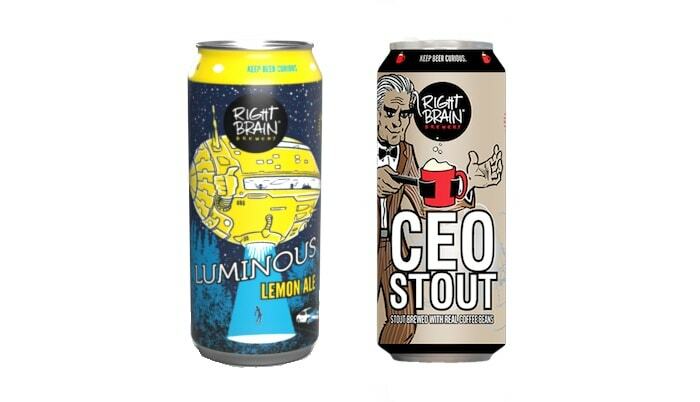 It ranks as Right Brain’s #1 selling beer for its chocolaty, espresso, and oatmeal flavors. Don’t think hard to drink when you read stout. This light bodied American-style stout is brewed with locally roasted espresso beans from Roaster Jack Coffee Co. and even goes down like a good cup of Joe. It even has caffeine! This is a local favorite among Paddle For Pints fans. An honorary beer crafted for the event, this ranks as one of summer’s must trys. It’s light, but the rolling Kolsch tastes don’t fall short. The blend of peach and citrus are perfect to glide with your while out on the kayak, canoe, or that flamingo raft-floaty. Plop one of these in your cup holder and you may even find yourself wanting to check out the next Kayak Bike & Brew. This is an American pale ale brewed for the North. The use of toasted malt gives it a deep, golden color but the citrus, floral, and berry aromas hand over a crisp and slightly bitter finish. It pays homage to the traditional pale ales that got the ball rolling on the American craft beer movement. Whether you’re UP-side or lower-north, crack one of these Michigan classics to keep your summer fresh. Labatt Blue’s limited-edition “Loving Michigan” cans. Labatt has been around for a while, and their initiative to support Michigan makes it a canned beer worthy of featuring. Labatt USA has made a $10,000 investment to protect and preserve water quality throughout the Grand Traverse Bay watershed. Their partnership with Grand Traverse BAYKEEPER to help protect the Great Lakes makes it one beer you’ll want to crack while out enjoying your Northern Michigan summer. Jolly Pumpkin makes USA Today’s List of the Top 10 Brewpubs!